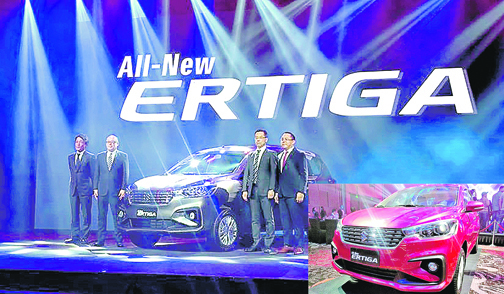 A multitude of guests from the Philippine motoring media, Suzuki dealerships, bank partners and Club Ertiga members joined the officers of Suzuki Philippines, Inc. led by SPH President Hiroshi Suzuki, at the Marriott Hotel Manila in Pasay City last January 23, 2019 to witness the unveiling of the all-new Suzuki Ertiga. Top executives of Suzuki Philippines take the wraps off the all-new Ertiga. The first-generation Ertiga was Suzuki’s best-selling vehicle. It offered comfortable seating for 7 occupants and was considered as the brand’s compact multi-purpose vehicle (MPV) offering the best value-for-money. The all-new Ertiga continues Suzuki’s mandate of value-for-money but features a stronger yet more elegant styling while packing the latest technological innovations from the Japanese automaker. “We owe it to our valued customers to give them nothing but our best”, said SPH Managing Director Norminio “Boying” Mojica. The Chief Engineer of the Suzuki Ertiga, Satoshi Kasahara, flew all the way from Japan to discuss the styling, interior, performance and safety features of the all-new Ertiga. It features Suzuki’s new generation platform, the HEARTECT, a light yet highly-rigid frame that effectively disperses impact energy to improve safety while reducing noise and vibration. Propulsion comes from a 1.5-liter 4-cylinder 16-valve K15B engine that produces 103 horsepower at 6,000 rpm and 138 Newton-meters of torque at 4,400 rpm. Transmission choices include a 5-speed manual transmission (M/T) and a 4-speed automatic (A/T) that distribute the power range to maximize fuel efficiency. The new platform is enveloped by an exterior styling that features a more aerodynamic body and a taller, fiercer front end treatment while retaining the general overall proportions that endeared the Ertiga to its owners and enthusiasts alike. It sports a more elegant front profile with an elegant chrome grille flanked by new stylish headlamps in a seemingly congruent yet edgy design. The rear was treated to an upgrade that gave the Ertiga an upmarket European car vibe, especially with the rear quarters and LED tail lamp treatment. “It looks more elegant”, cooed Suzuki dealer principals Anthony Cheng and Mike Tan. On the other hand, the interior of the all-new Ertiga is designed with sophistication, flexibility, and spaciousness in mind. The new HEARTECT platform distributed the space within the all-new Ertiga to provide larger passenger legroom for the 2nd and 3rd row seats while an innovative flexible seating arrangement allows all kinds of stuff to be loaded into the MPV and transported safely. Passenger comfort is enhanced with a rear air-conditioner that keep the 2nd and 3rd row passengers cool while small storage spaces, such as a ventilated cup holder, improved center console, and door pockets, add convenience all around. “I’ve sat in the 3rd row and it felt comfortable”, boasted Suzuki dealer principal, Felix “Bingo” Limcauco. Sporting a fiercer look and boasting maximum functionality, the all-new Suzuki Ertiga now combines strength and elegance in a compact body, allowing Filipino families to go on adventures and seize the day in style. With superior riding comfort, the all-new Suzuki Ertiga will help make tackling the heavy Metro Manila traffic more bearable as well as help pass the time away more pleasantly. “I’m confident that the all-new Ertiga will be Suzuki’s best-seller as it was with the previous model”, stated Leo Lei of Suzuki UN Avenue. The all-new Suzuki Ertiga is available in four variants starting with the GA M/T at P728,000; GL M/T at P848,000; GL A/T at P888,000; and GLX A/T at P978,000. It comes in 7 colors: Pearl Glorious Brown, Metallic Magma Gray, Pearl Burgundy Red, Prime Cool Black, Metallic Silky Silver, Pearl Radiant Red and Pearl Snow White. Please call or visit your nearest Suzuki dealers for more details or to book a test drive.